Libby's Little Addiction: FCD Blog Hop: Reduce, Reuse, Recycle! FCD Blog Hop: Reduce, Reuse, Recycle! After I gave up, I took a look to see what the other ladies came up with - and low and behold Tesa had the same idea to use this sort of packaging!!! But of course hers turned out GREAT!! So... why don't you go ahead and hop on over to Tesa's blog and start the hop there?? It's a circular hop so you'll end up right back where you started. And, leave comments along with the way, because as usual our generous boss Pam is giving away some candy! Have fun, and I promise I will actually stamp again... someday... :-) Thanks for stopping by! Ha! At least you didn't announce that I had tried to shove you into the dark and dingy garage. Aww..well at least the effort was there, and maybe next time those microbeads will work out for ya! 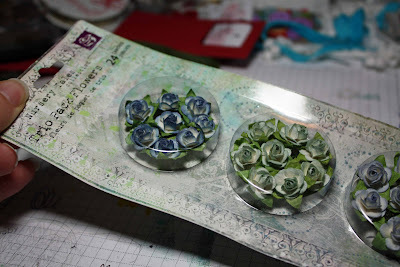 BTW, love those Prima flowers, too cute! My mojo has went elsewhere too. Maybe we can both find ours together? :) LOVE those flowers though! I made it thru all the blog hops thanks to you enabling and I needed to get busy on this house...so its all your fault...lol!!! Hi Libby!! I just read a comment you posted on my blog back in August!!! Just a wee little behind. I am back though, and can't wait to catch up on all the blogging thats been going on!! Rather cool blog you've got here. Thanx for it. I like such topics and anything connected to them. I definitely want to read a bit more soon. Don't ya just hate it when that happens! Dang.. I hope your mojo has come home, Libby. Hi Libby! I'm not sure how I missed this post, but I'm so glad I stopped by to see what you were up to. First of all, your story made me smile! Too funny about the garage/light switch. And yes bird seed is a brilliant idea! I hope you will find your mojo soon girly, and that you are enjoying your break, spending time with your little ones. And lastly, I LOVE those flowers! I gotta find me some of those, thanks for the inspiring me to spend money, teehee!